아프리카는 세계에서 두 번째로 촉망 받는 투자처로 부상했다. 지난 10년간 외국인 직접투자 규모는 3배 증가하였으며, UN무역개발협의회에 따르면 2013년도에는 그 금액이 563억 달러에 달했다. 해외 투자자들은 단 30년 만에 산업국가로 부상한 아시아 호랑이의 경이적인 성공을 기억하여, “아프리카 사자의 시대”라는 새로운 용어를 만들어내기에 이르렀다. Africa is now rated the second most attractive investment destination in the world. Investors have nearly tripled their share of foreign direct investment (FDI) projects in Africa over the last decade. The value of FDI in Africa was estimated at US$56.3billion in 2013, according to UNCTAD data. International investors are now coining the phrase “an age of the African lions”, harking back to the phenomenal success of the Asian Tigers which became rich industrialized nations in a span of just three decades. Muhtar Kent, Chairman and Chief Executive Officer of The Coca-Cola Company said that the presence and the significance of their business in Africa were far greater than India and China …. back in 2011! 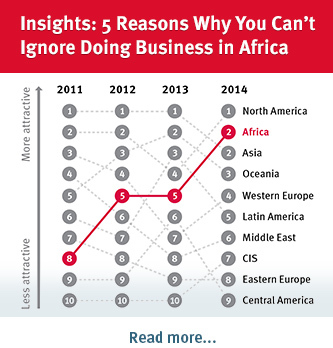 Are major investors around the world missing out on emerging African opportunities? Here, Butterfly Effect Intelligence, the GIA Member based in South Africa, lays down some facts that may not be widely understood outside of Africa, but which are necessary in developing a clearer view of the true investment climate in Africa. There appears to be an enormous divide in the outlook of the true investment potential of Africa. According to the Africa attractiveness survey 2014 by EY, “established Investors” who are active in Africa rank the continent as the most attractive investment destination in the world today, with 87% saying that its attractiveness will improve over the next three years. “Not established investors”, who have yet to invest, swing to the other extreme and rank Africa as the least attractive investment destination in the world. Half of them believe Africa’s attractiveness will improve - and yet only 10% have a specific strategy for investment in Africa. Africa’s resource potential is virtually limitless, but up until recently the ‘dark continent’ had not been able to attract the levels of foreign investment required to make prosperity a reality. Africa’s time has now come, as stable governments with clearer fiscal policies start to emerge in Africa, reducing the levels of perceived risk for foreign investors. Countries like Botswana, Namibia and South Africa have consistently received better-than-average global scores for their governance in recent years, according to rankings based on World Bank research. As a result, there is a real and accelerating marketplace for African mining projects leading to mining momentum. The foreign currency earned from resources can be used to educate the population, and low-level manufacturing has begun, providing better jobs and higher pay for the local population, stimulating consumption. With improved education and higher-value jobs comes further GDP expansion. While the extraction of natural resources remains key in Africa, interest in consumer-facing sectors is increasing, particularly in financial services, telecommunications and consumer products, proof that the momentum created from mining is having a positive impact on earning potential of African consumers. Africa's consumer spending is expected to boom in the coming years. McKinsey Global Institute predicted that it would grow from $860 billion in 2008 to $1.4 trillion by 2020. According to the World Bank, Africa’s middle class is expected to grow from 355 million (34 percent of Africa’s population) to 1.1 billion (42 percent of the population) in 2060. By that time, middle class consumers on the continent will be spending on healthcare, telecoms, education, housing and entertainment, beyond the bare necessities of food and shelter, and become one of the biggest catalysts for growth on the continent. They will demand international brands and western goods. Another consumer group can be found at the ‘bottom of the pyramid’; low income earners who make up the majority (over 70%) of the population. Although this segment of the population resides in the ‘poor’ category, its sheer size makes the collective buying power of this group attractive. Global brands such as Nestle are already targeting these lower-income consumers with affordable products, generating higher volumes of sales albeit at lower margins. Nestle currently generates revenues of more than US$3billion in Africa, and employs more than 15,000 people across the continent. It plans to double its revenue in Africa by 2020. Over US$1b has been invested in more than 20 FDI projects over the past decade, building up local manufacturing capabilities, expanding distribution networks and developing products that cater to the needs and pockets of low-income consumers (source: Ernst & Young African Attractiveness 2014 survey). Two out of three of the anticipated 2 billion African consumers by 2050 will be of working age – that’s 1.3 billion people. Governments and more dynamic finance institutions are expected to rise up to encourage and promote the development of small to medium sized enterprises, to combat the challenges of unemployment. This is another interesting target market. According to the United Nations, Africa’s level of urbanization (40%) is greater than India but less than China (50%). Africa will have 15 cities with a population in excess of 5 million people by 2030, says Oxford Economics. Those cities are Lagos (Nigeria), Kinshasa (Dem. Rep. of Congo), Dar es Salaam (Tanzania), Luanda (Angola), Abuja (Nigeria), Abidjan (Cote d’Ivoire), Nairobi (Kenya), Ouagadougou (Burkina Faso), Khartoum (Sudan), Kampala (Uganda), Douala (Cameroon), Yaounde (Cameroon), Kano (Nigeria), Kumasi (Ghana), and Lusaka (Zambia). In fact, Africa already has more cities with one million people than North America. African mega cities are emerging as the continent transitions from a primarily agriculture and resource-based economy to a more industrial one. More and more people from rural farming communities are expected to flood into the urban centers in search of better jobs and pay. We are already witnessing this in countries such as Nigeria, Cameroon, Kenya, Ghana, Tanzania and Zambia. African cities such as Lagos, Nairobi, Accra and Durban are becoming hotspots of economic development. Infrastructure is being developed to connect these hubs, such as roads, railways and new airports. In the future, urban clusters and corridors will link up major populations that are living in close proximity and create sizable markets and trade routes. Two out of three Africans now have a mobile phone. Voice call traffic in sub-Saharan Africa is expected to double, with mobile data usage growing 20 times between 2013 and 2019, twice the anticipated global expansion. Ericsson released a Mobility Report for Sub-Saharan Africa in June 2014, predicting that mobile subscriptions in Sub-Saharan Africa will jump from 635 million to around 930 million by the end of 2019. Nigeria and South Africa are still the leading Sub-Saharan countries in terms of mobile subscription numbers, followed by Kenya, the Democratic Republic of Congo and Ghana. In terms of net additions per country, Nigeria leads, followed by the Democratic Republic of Congo, Uganda and Ghana. The telecommunications boom in amalgamation with financial services has made money transfer possible through basic mobile phones in countries such as Tanzania and Kenya. Local businesses are designing easy to use mobile apps to target a tech savvy population in West, East and Southern Africa. This telecommunications and digital revolution on the continent will allow companies to reach investors directly. It also enhances the popularity of social media and social media marketing. Source: Sub-Saharan Africa Mobile Economy 2013, Internet World Stats. All the above have been made possible through greater focus on peace, business and education. Despite the sensationalized deterioration of peace in countries such as Egypt and Central African Republic of late, there is an overall trend towards fewer conflicts and more democratic elections across Africa. Most African states are now democracies. Although these young democracies are not completely free and fair, they are infinitely better than before. Most African countries have followed a gradual process of political liberalization accompanied by fewer armed conflicts across the continent. There is also an increasing pressure on the governments of these new democracies to deliver a better life for all, which means less mismanagement of funds and more cash trickling down to the masses instead of ending up in the Swiss bank accounts of the elite. Prosperity is expected to follow peace on the continent. Moreover, the trend towards a one Africa strategy is gaining momentum. Five Regional Economic Communities (RECs) represent the building blocks for accelerated regional integration. There is already an agreement between 26 member states for three RECs to establish a Free Trade Area (FTA). This FTA will represent one of the largest rapid-growth economies after the BRICs with a GDP growth rate in excess of 5%. These five RECs have acted to deepen inter-country links by harmonizing legislation relating to customs union and common market protocols. The East African Community (EAC) for example, aims to have a common currency across the five countries that make up this region by 2023. It is a little known fact outside Africa that the number of school years completed by the average African has increased more than fivefold since 1960. The level of education in Africa is slowly catching up with the rest of the world, with governments and private sector players making significant investments in education across the continent. For example, Old Mutual, a financial services giant in Africa, has established a foundation called the LEAP Science and Maths School aimed at talented learners from grades 10 to 12 from disadvantaged backgrounds. The focus of the programme is on raising the level of Science, Mathematics and English in South Africa. The Old Mutual Foundation has invested R17,644,521 million (US$1.6 million) into LEAP Science and Maths Schools since its launch in 2004. In that time LEAP has achieved a remarkable 94% Grade 12 pass rate in the National Senior Examinations. Educated, qualified, competent managers are in high demand and short supply in Africa. The good news is that more and more corporations that have applied an expatriate model in the past, are now starting to invest in identifying and grooming local talent. Financial skills are in particularly high demand and short supply in Africa. Many companies run their own bursary and mentorship programmes to cultivate this talent locally. For example, Investec Specialist Bank provides extensive funding and mentorship to select tertiary students that pursue a career in finance. To identify and cultivate local talent, bursary students are mentored by Investec employees, who provide academic guidance and social support to students as they navigate the challenges of their tertiary career. Investec bursary students are also given the opportunity of attend a work readiness programme during their final year of study to help groom them to become skilled, employable resources. Planning to enter Africa for the first time can be daunting. Many investors use South Africa as a springboard into the rest of Africa since it is the easiest African country to do business in, attracting the most foreign direct investment on the continent. The hot spots for investment right now are agriculture, financial services, consumer goods, infrastructure, mining, mobile telecommunications, as well as oil and gas. One first step would be to do a comprehensive market assessment in South Africa. Another approach would be to do a top line assessment of all countries in Africa to identify the major markets that hold the greatest potential for the particular industry in question. This would be followed by and in-depth market assessment in a short list of key markets. Investors should not miss out the age of the African lions and examine the wide-open opportunities to set up a foothold on the continent now. Global Intelligence Alliance (GIA) is a strategic market intelligence and advisory group. GIA was formed in 1995 when a team of market intelligence specialists, management consultants, industry analysts and technology experts came together to build a powerful suite of customized solutions ranging from outsourced market monitoring services and software, to strategic analysis and advisory. Today, we are the preferred partner for organizations seeking to understand, compete and grow in international markets. Our industry expertise and coverage of over 100 countries enables our customers to make better informed decisions worldwide.